Worthy’s Pinkwaste.com is a Family-Run and Family-Owned independent waste collection service specializing in residential and commercial waste removal. Having “Grown-up” in the trash hauling business, owners Terry Jr. & Mike have acquired over 30 years experience in the waste industry. They have worked and continue to work in all aspects of the business. As a family owned company, we offer refuse service to residential and commercial properties including family neighborhoods, apartment communities, small businesses, and large companies. Every single customer is an integral part of our family, and we strive to bring you the efficient and excellent service that you deserve! 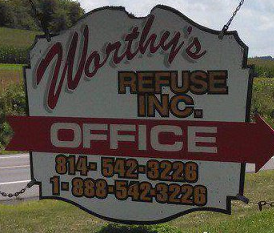 As of 2009, Worthy’s expanded the business service area to include Franklin County as well as the current service area including Huntingdon, Mifflin, and Juniata Counties. In 2013 Worthy’s made a decision to “rebrand” the company to give back to the communities and customers they serve. Worthy’s Pinkwaste.com is now the “new” name with the same belief Worthy’s Refuse was built on. Worthy’s Pinkwaste.com is a program devoted to help raise awareness in the fight against breast cancer. We take pride in the progress our company has made over the years through the ongoing efforts of our family and employees. As we continue to grow, we strive to still provide service that represents a high value to our customers and still believe in giving our customers the friendly, courteous service they deserve.